Femoral antetorsion is the angle between the femoral neck and the femoral condyles. Several methods have been described for measuring femoral antetorsion on MRI. Transverse method: The anatomically correct measurements are done on strictly transverse images over the proximal and distal part of the femur. For the proximal part of the measurement, the reference line needs to be drawn on two or more consecutive transverse images, as can be achieved in most modern image viewing systems (PACS). Together with the distal reference line this constitutes the femoral antetorsion angle [Sutter 2012]. Oblique method: Many MRI protocols feature oblique images that are parallel to the femoral neck. 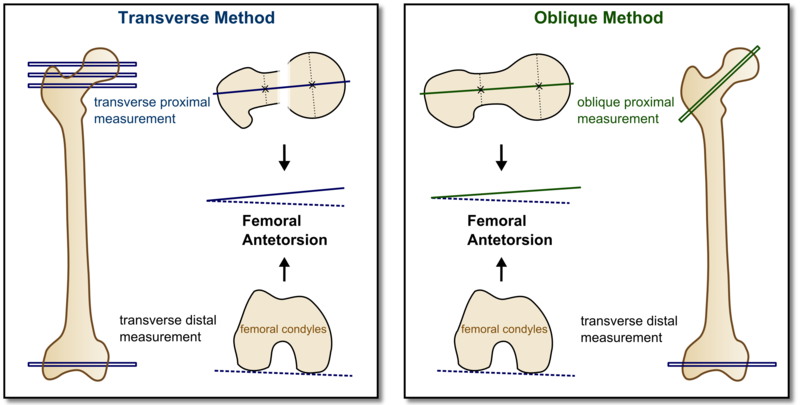 If these images are employed for measuring femoral antetorsion, a conversion needs to be performed in order to obtain the correct antetorsion values as has been described in a recent paper [Sutter 2015]. For this conversion, a free online calculator is provided on our website that makes it faster and easier to perform this calculation. The calculator can be used if the oblique antetorsion value and the inclination angle of the oblique image plane are known. The proximal line (= proximal ray) for the angle is drawn by connecting the center of the femoral head with the center of the femoral neck at its base on an MRI image (marked by x in figure above). The distal line (=distal ray) for the angle is the line connecting the posterior borders of the femoral condyles on a transverse MRI image. 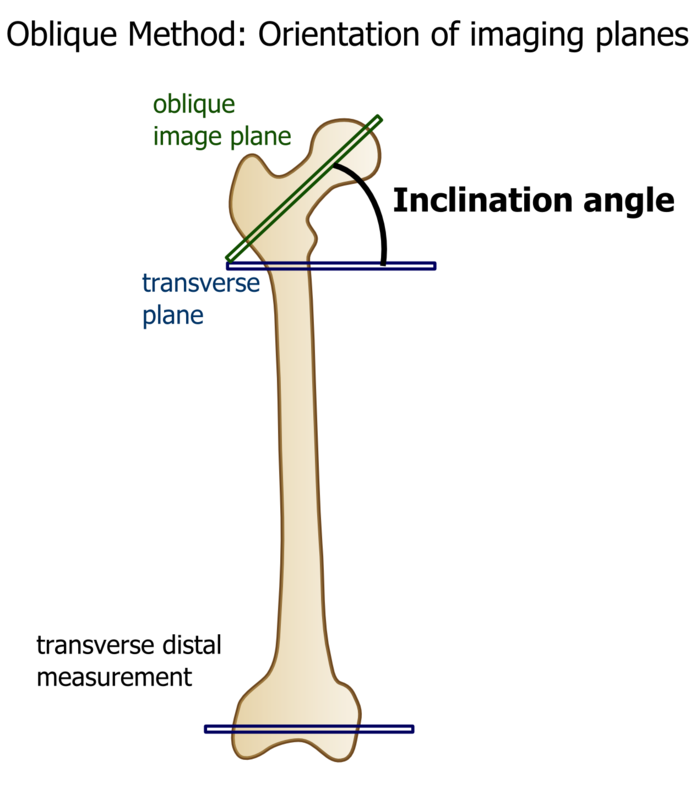 The inclination angle is measured on a coronal MRI image and is defined as the angle between the oblique image plane and the transverse plane.